I’m probably behind the times, per usual, but I just watched the “What we learned from 5 million books” TED talk: a talk by researchers who used Google Book’s repository to run statistical queries on language usage. They explore how the language shows censorship and propaganda efforts, how our memory is shrinking, and the switch in usage from “throve” to “thrived” among other topics. Generally, I’d just share this on social media and be done talking about it, but I was in the midst of authoring a short bit of character building for a costume project (my creative process is a bit strange, yes). That writing may never see the light of day, but it did make me wonder about whether some of my phrasing fit the character—an educated British individual circa 1885 (albeit in an alternate reality). Take the phrase “needs must,” which sounds deliciously antiquated to our ears. 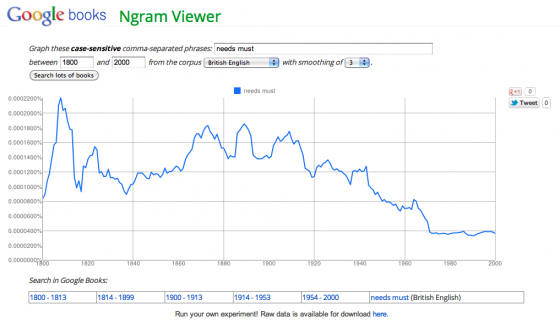 Graphed it in Google Ngrams, that makes sense—though never immensely popular, it has seen a pretty steady decline in usage from the late 19th century through the present. My character might use it, however. The vignette focuses on my character meeting a journalist, but would she have called the journalist a “journalist”? Possibly, but it is more likely that she’d use the term “correspondent”. And when they meet? 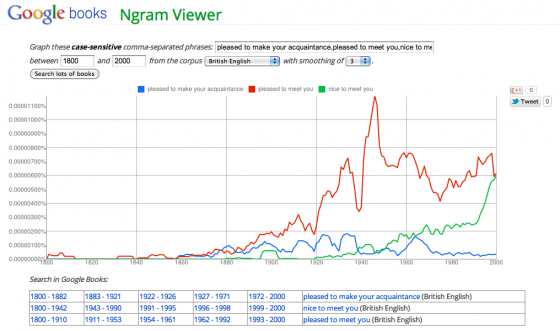 Well, one of them might say “pleased to make your acquaintance,” or perhaps “pleased to meet you,” but “nice to meet you” would be very unlikely according to the Ngram viewer. When writing period pieces, it’s worth the effort to your readers and craft to cull blatantly anachronistic phrases from your writing. Not to mention, if you’re stuck on something, you can play around with alternatives to see what might be a more timely fit. 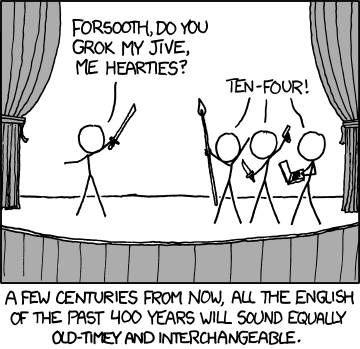 Do you grok me? 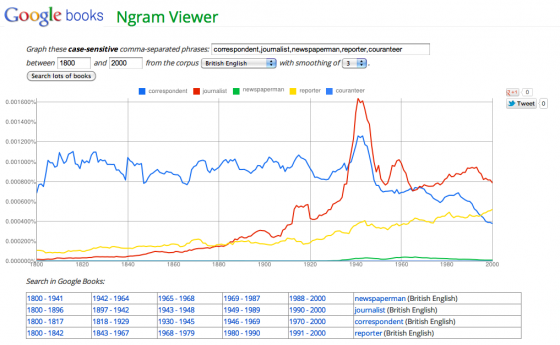 Go explore Google Ngrams on your own. You never know what you might find.